NOTE: This post was originally published at princetonalumniweekly.blogspot.com. The lecture, covering Emil Fischer’s work with glucose, was to be Jones’ last at Princeton, and the professor began by pouring his customary mug of tea before picking up a stick of chalk and working his way across the wide, eight-paneled blackboard. He paused in the middle to introduce emeritus professor Walter Kauzmann, who hired Jones 42 years ago. When Jones erased the board to start the second section of his lecture, he urged his students to remember the needs of professors and include funds for fresh erasers and chalk when they make donations to the University as alumni. 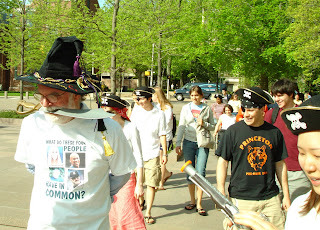 Soon after that comment, Jones’ lecture was cut short when a group of former students dressed as pirates rushed the aisles and staged a mutiny of sorts, presenting Jones with a treasure chest that included a hat, two T-shirts, and – as if on cue – generous supplies of erasers and chalk, wrapped in gold foil. But the prizes came with a price: the students tied Jones’ hands and took him outside to the fountain next to Robertson Hall, where they forced him to walk the plank. Jones did not go quietly, freeing one hand and playfully jousting with a plastic sword, but he eventually obliged, plunging ankle-deep into the water. On April 21, a group of Princeton students set aside their work in particle physics, condensed matter and the like to turn their attention to works by Chopin, Mozart, and Handel at the physics department’s 19th annual recital. Nearly two dozen graduate students, undergraduates, staff members, faculty, and friends of the department performed in this year’s two-and-a-half hour program, which drew a full house at Taplin Auditorium. Other artists from physics displayed paintings and photographs at a post-concert reception in Jadwin Hall. The recital is the brainchild of Laurel Lerner, the assistant to the physics department’s director of graduate studies, who is a musician and piano teacher. Nearly 20 years ago, after hearing about the musical talents of several graduate students, Lerner organized a talent show for physics students at a rehearsal studio in Woolworth Hall. In the years since, the event has grown, thanks in part to planning help from friend and fellow staff member Eva Zeisky. Done found a home at the Providence (R.I.) Black Repertory Company, where it opened April 20. The show’s run continues through May 20. For information and tickets, visit http://www.blackrep.org. Liz Williams ’09 returns a serve during an impromtu volleyball game on the sand court in Rocky-Mathey courtyard on May 4, the last day of spring term classes. Spring exams for undergraduates begin May 16. The Princeton men’s lacrosse team will travel to Georgetown for a first-round matchup against the sixth-seeded Hoyas in the NCAA Championships May 13. The game, which starts at noon, will be broadcast live on ESPNU. The Princeton women’s lacrosse team will face third-seeded Virginia in Charlottesville at 1 p.m. May 13. The Tiger men, led by standout goalie Alex Hewit ’08, allowed the fewest goals in Division I during the regular season while posting a 10-3 record, including a 5-1 mark in Ivy League games. Princeton’s women, who are making their 10th consecutive postseason appearance, were 10-6 this year. Work and family – A 25th reunion survey about life after Princeton answers some questions and raises others, Cynthia King Vance ’80 writes. Under the Ivy – Gregg Lange ’70 writes about Paul Robeson’s Princeton roots and wonders what might have been. On the Campus – Laura Fitzpatrick ’08 drops in on a new campus art studio and the International Festival Gala. Do you know of alumni who have started Web-based companies in the past year? PAW would love to hear about them, for possible inclusion in a story for the magazine. Write to PAW and let us know.